I'm back in the Big Apple for my fifth New York Fashion Week (can you believe how time flies!? ), and I'm getting street style ready with Express! 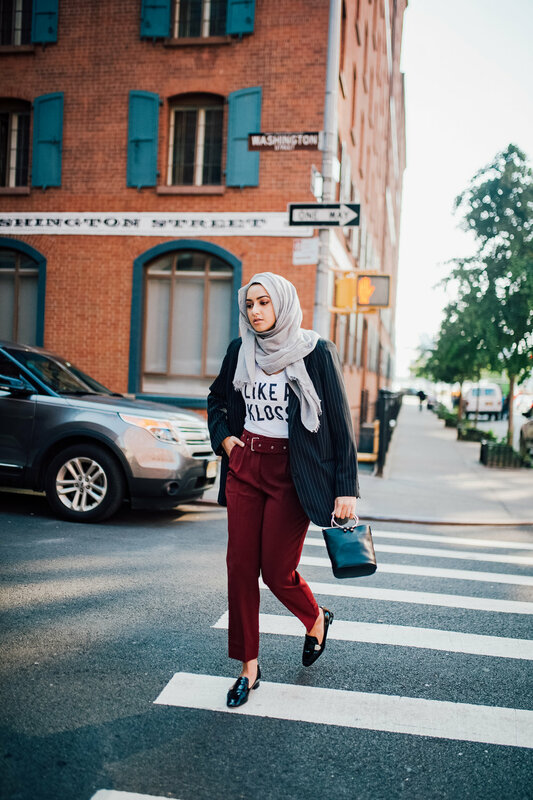 Often times, we find ourselves sacrificing comfort for style, but today I'm showing you an outfit I styled from Express for Fashion Week that is just as comfy as it is trendy. I had one of the busiest fashion weeks this season in terms of appointments, so it was crucial to be in something loose and flexible for a full day of walking in NY! I chose to style the "Ticking Stripe Boyfriend Jacket" because its simple print matches almost anything, while still adding a bit of drama in the shoulder pads and detailing. I would also style this blazer with boyfriend jeans and a tee, or a jumpsuit underneath. Along with it, I'm wearing the "Belted Ankle Dress Pant" in purple, since I love the luxurious silver details in the attached belt. These pants are a great color for transitioning into autumn! 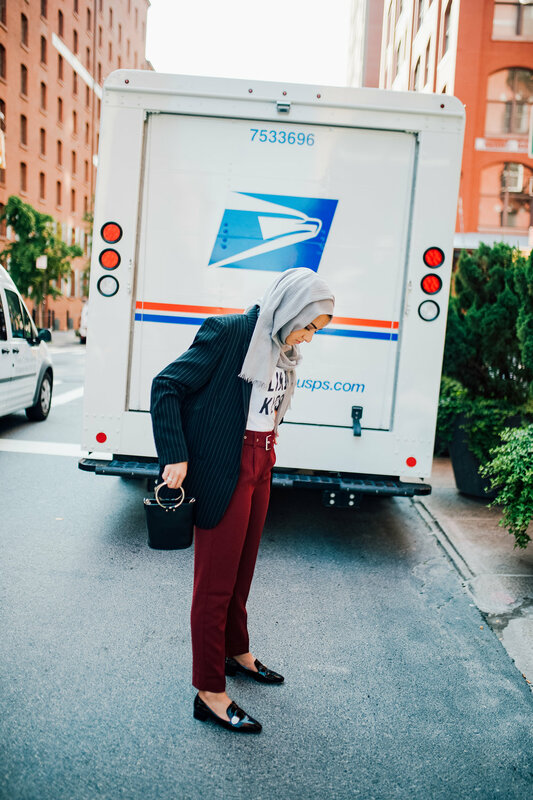 Next, I went for a simple statement tee that I received during my participation in the Express x Karlie Kloss runway- find it here! To tie the look all together, I'm carrying the "O'ring Handle Crossbody Bag" in black. This bag style is one of the most coveted trends out there this season, and I'm so glad I was able to find it at my local Express at a great price point and quality! I'll definitely be wearing it in upcoming fashion week looks! One of my favorite things about this look is that each piece is mix & matchable on its own for everyday occasions. I could wear this outfit to a fashion week show, to work at an office, or even out with friends-- and it can all be tweaked with the change of a shoe (whether it be loafers, heels or sneakers)! I wore small heeled loafers here to fit several occasions, and would recommend the same! Here and here are some of my favorite Express loafers at the moment. Head into any Express store or online and use code "1703" at checkout to receive $25 off your in-store purchase of $100+ - valid now thru 10/15! (Exclusions apply, please see site for detail. ) Happy shopping!